Description: EMI Japan's Premium 200-gram Vinyl Reissue Series! Mastered from original analogue tapes! 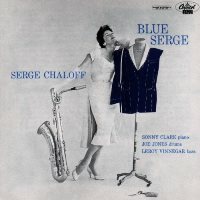 Originally released in 1956 by Capitol Records, Blue Serge is the most accomplished and understandably most popular album by the extraoridnary baritone sax player, Serge Chaloff. He was a true pioneer of baritone sax in jazz who played the large, unwieldy instrument with dexterity and grace. Influenced by Charlie Parker, he was also the first person to play bebop with the bari. Unfortunately he died of cancer at age 33, so he left only a handful of recordings. This album came out of sheer luck. Chaloff, who was based in Boston, happened to be in Los Angeles after a series of cross-country gigs, and so was drummer Philly Joe Jones who was visiting with the Miles Davis Quintet. To complete the group, Chaloff picked unfamiliar (to him) local musicians Sonny Clark and Leroy Vinnegar. Well, in hind sight this was a dream team, but at the time they were relatively young, up-and-coming musicians. The quartet went into the studio with no rehearsals and no tunes set, and created a great album that is considered by many now as a classic. Pressed in the U.S. with vintage pressing machines in an attempt to replicate the sound of the 1950s, the sound of this Japanese reissue vinyl is fantasitic - very natural and authentic. Highly recommended for vinyl aficionados, collectors and fans of Serge Chaloff! Recorded in March 1956 in Los Angeles. Mono. Originally released as T742 by Capitol Records in 1956. This limited 200-gram vinyl reissue released by EMI Music Japan in 2013.